I have some time to write about another new band (to me anyway). 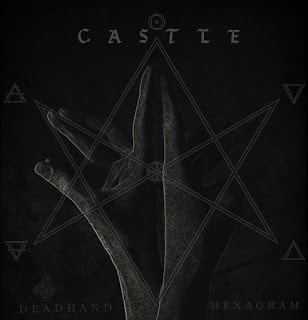 While doing my research for this review, I noted that Castle have signed with Prosthetic Records. That label has been signing some brilliant bands of late, with the likes of Trap Them, Ramming Speed, North and Deathrite joining them in recent times. Tonight's review focuses on Castle's latest EP released via Van Records though. Two tracks of heavy metal, US style. Deadhand Hexagram was released as a precursor to their Van/Prosthetic full-length "Under Siege" that came out in May. Castle are true to the heavy metal formula, featuring plenty of melody and ballsy guitar. The title-track from this EP is gloriously old-school and it’s easy to see why they’ve gained so much attention recently. The trio produce a delivery that would sit perfectly on Guitar Hero, with Elizabeth Blackwell’s vocals ringing out like those of a sultry Siren. Be My Ghost (Reprise) features a slower pace and melancholic atmosphere. The gently plucked guitars are sensitive to the feeling being portrayed and the orchestral moments belay Castle’s heavy metal leanings. It’s strangely calming after hearing Deadhand Hexagram and as it fades, so does the fire inside your soul. Castle ignite it but also extinguish it with great power and grace. While certain “washed up” rock-stars claim that rock is dead, those in the know are guided to bands like this. Long may it continue!